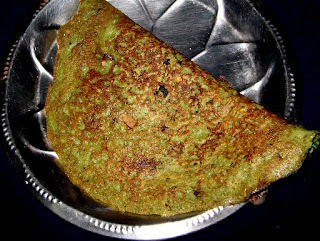 Heat a Tava,on the Stove.Let it heat,after heating ,spread 1 spoon oil on the Tava.Add 2 tbsps Pesara batter and spread it on the Tavva as a Dosa,add 1 tsp Oil.Sprinkle a few chopped Ginger and Green chilli and onion pieces and Jeera on the Pesarattu. Remove after its fried to light brown colour. Serve hot in a plate. Somepeople eat it with chutneys,and some people eat it with a combination of Upma. Do we have to soak the dal or grind it instantly? If u r doing with whole moong dal then soak it for 4 to 6 hours.If u r doing with split moongdal then 1 hour is enough.You can also wet grind the whole and split daal,immediately after washing them, but more water is required..Health wise the third is best,even if you eat,one or two more no problem arises.